Emily (Emma) Jane Lemmon was born in DeKalb, Texas on May 16, 1885, her parents were Robert and Elizabeth Lemmon. She had one brother, Robert Lemmon Jr. and one sister, Nancy Elizabeth Lemmon. Robert served in the cival war and had shrapnel in his back and legs, he couldn't hold a steady job due to the injuries and often cut firewood to put food on the table. Elizabeth died giving birth to Nancy Elizabeth, Robert remarried and had 2 more girls, Sally and Donna Lemmon. After Elizabeths death Robert Jr. left home and Emily took her sister Nancy and found enough work as a maid to support them. In 1901 Emily married Charles Henry Terrell born in 1880, they had 2 sons, Clarence Edward Terrell and Joseph Homer Terrell. In 1912 Charles was on a train coming home from a trip to visit his mother when another passenger on the train became violently ill, the conductor asked Charles to help him move the passenger into isolation, he volunteered to stay with the passenger till they could get help and subsequently he caught the Spinal Meningitis and by the time he got home he was violently ill himself, Emma asked his parents to come help but they were afraid of catching the fever themselves so she stayed by her husbands side alone until he died. After the funeral his parents did offer help for her and the children but she was so hurt and angry that she reused to have anything more to do with them. In 1917 Emily went to a rodeo and a singing cowboy saw her in the audience and sang a wedding proposal to her. 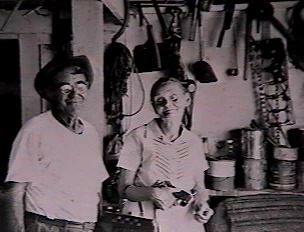 She had never seen him before that day but he impressed her so much with his song that she accepted and married John Thadeous Columbus Nix born 6/7/1883 in Calhune County, Mississippi died 4/7/1979 in Kennewick, Washington. They had one daughter, Mary Edna Nix born August 24, 1918 in Middleothien, Texas. Emma and John owned a farm in Dallas, Texas where J.F.K. Airport is now. They also homesteaded 640 acres apiece for a total of 1280 acres in the Texas Panhandle. For a while they ran a hotel in Durango, Texas and later they built an adobe house in Riodosa, New Mexico. Emma died January 21, 1962 in Phoenix, Arizona and is buried there in an unmarked grave. She died of Cancer of the Uterus.